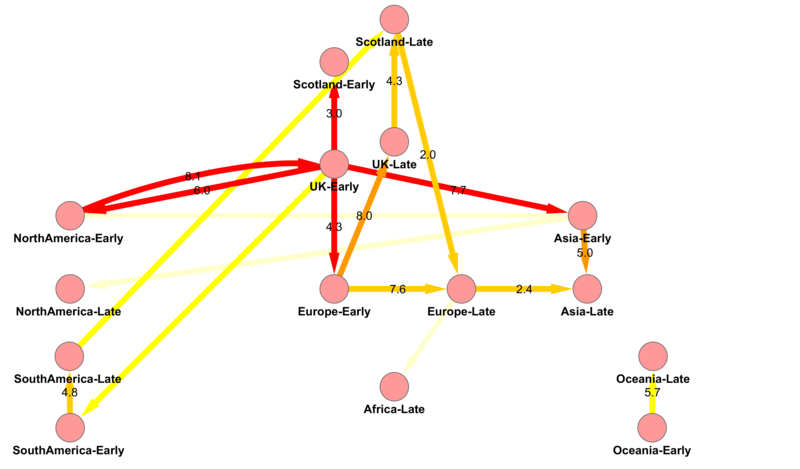 Migration rates of influenza A H1N1 2009 strains between Scotland, RUK and continents. Rates were estimated using BEAST trees and a discrete traits model. The diagram was created by combining five independent BSSVS discrete trait runs of 10000000 steps each, sampling every 1000 with a 10% burn in. Edge values represent the median transition rate per year (calculated as the median of the individual rate�the overall discrete clock rate). Only rates with indicator probability >=0.5 are shown. Edge colours represent the mean of the indicator probabilities across the runs: palest yellow, 0.5-0.6; yellow, 0.6-0.7; pale orange, 0.7-0.8; deep orange, 0.8-0.9; red, 0.9-1.0. Reconstruction of the sequence of reassortment events leading up to the emergence of S-OIV. Shaded boxes represent host species; avian (green), swine (red) and human (grey). Coloured lines represent interspecies-transmission pathways of influenza genes. The eight genomic segments are represented as parallel lines in descending order of size. 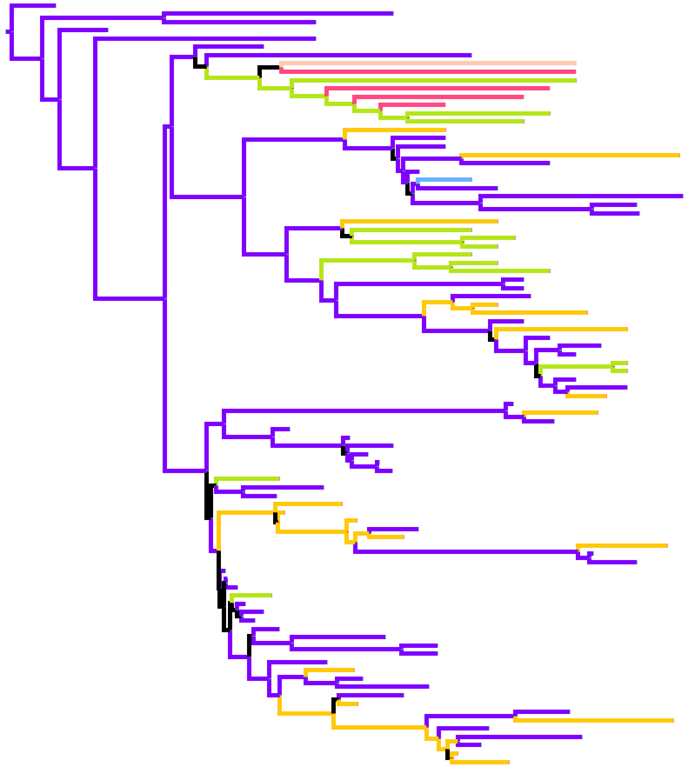 Dates marked with dashed vertical lines on �elbows� indicate the mean time of divergence of the S-OIV genes from corresponding virus lineages. Reassortment events not involved with the emergence of human disease are omitted. Fort Dix refers to the last major outbreak of S-OIV in humans. 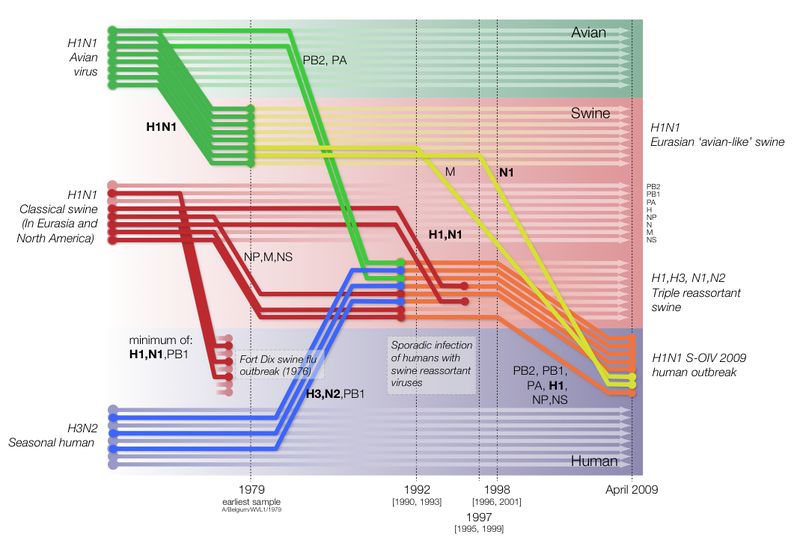 The first triple-reassortant swine viruses were detected in 1998, but to improve clarity the origin of this lineage is placed earlier. 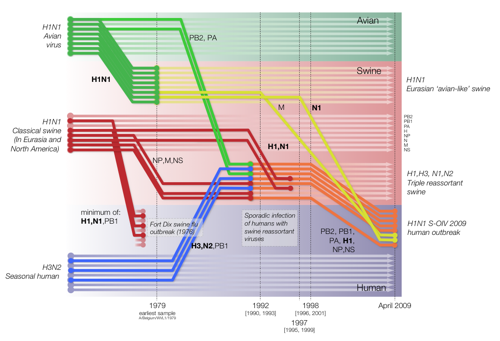 HPAI H5N1 strains are not equally virulent in mammals, and some strains have been shown to cause only mild symptoms in experimental infections. We undertook a meta-analysis of 27 experimental studies and used Bayesian graphical models (BGM) to increase the power of inference. Amino acid sequence data in all 11 genes were coded as binary data for the presence or absence of mutations related to virulence in mammals or nonconsensus residues. Sites previously implicated as virulence determinants were examined for association with virulence in mammals in this data set, and the sites with the most significant association were selected for further BGM analysis. 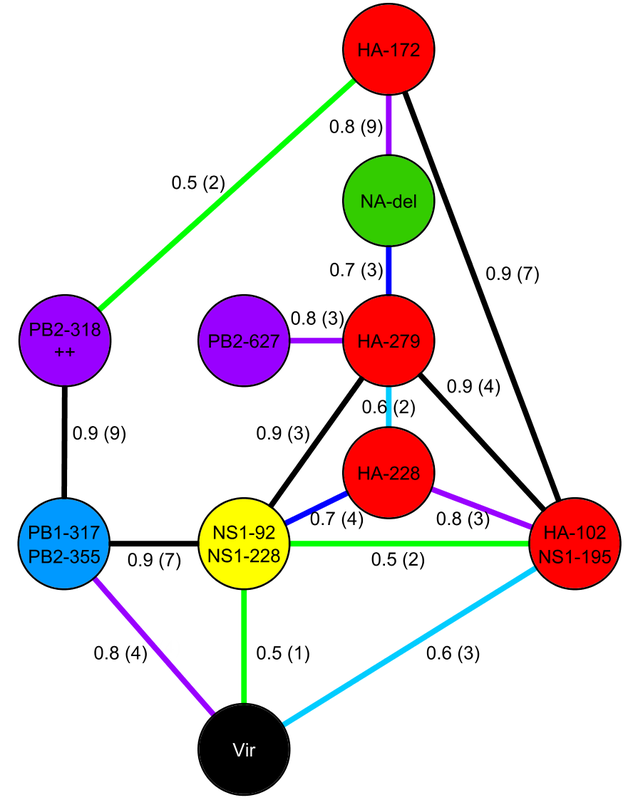 The analyses show that virulence in mammals is a complex genetic trait directly influenced by mutations in polymerase basic 1 (PB1) and PB2, nonstructural 1 (NS1), and hemagglutinin (HA) genes, and reveal several intra- and intersegment correlations. Please see the main text for more details. The indicated link probabilities from 10x cross validation and z-score from comparison to null models (in parentheses) are rounded down, e.g., "0.8 (3)" means a link probability of 0.8 to 0.9 and a z-score of 3 to 4. Note that some nodes represent more than one site. The sites directly associated with virulence in mammals are PB1-317/PB2-355, NS1-92/NS1-228, and HA-102/NS1-195. We did not detect a significant direct association of PB2-627 alone with virulence in mammals in this model; however, a strong direct association, with a probability of 0.8 (standard score = 3 to 4) was detected for the combined sites PB2-627 and PB2-701 (data not shown).